4.8 out of 5 based on 222 ratings. The legend of the Lady of Shalott supposedly takes place during the time of King Arthur and the Knights of the Round Table. The lady is imprisoned in a small castle by a fairy who tells her that if she looks upon Camelot a curse will come upon her, but she does not know what the curse is. In the castle the Lady of Shalott has a mirror in which she can see shadows of what is happening in Camelot. She enjoys weaving the images she sees on a magical loom. One day she sees the knight Lancelot through the mirror and falls madly in love with him. She decides to leave Shalott and take the chance that she will be able to gaze upon his face and enter Camelot. As soon as she steps out of the castle the mirror cracks and she knows the curse has fallen upon her. She runs down to the water, boards a small boat, and heads off towards Camelot, but sadly she dies just before reaching it. Her dead body is found in the boat which floats to Camelot’s shore, her name written around its prow. 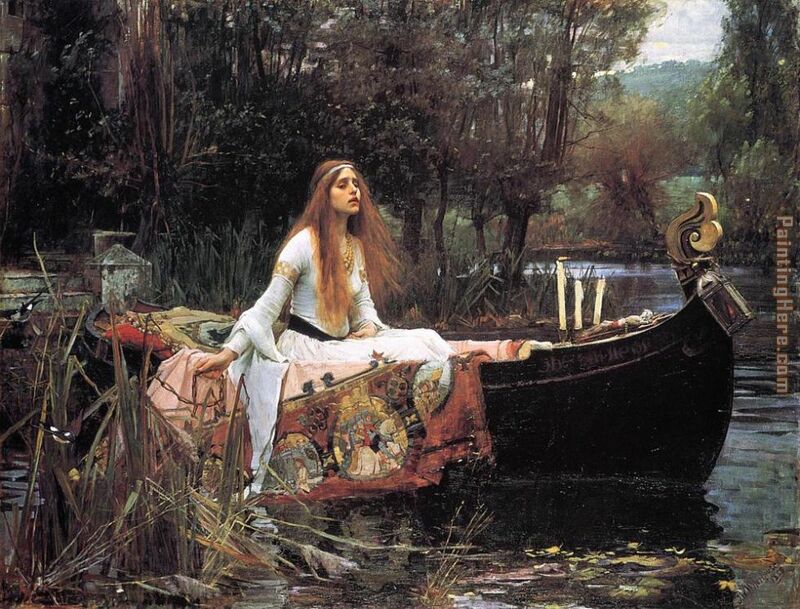 The Lady of Shalott is said to foreshadow the downfall of Camelot. Just as Sir Lancelot was the Lady of Shalott's destruction, his affair with Queen Guinevere leads to the destruction of Camelot. Waterhouse fully captured the Lady in her crazed, frantic state, desperately trying to reach Camelot, dying as she goes. On the front of the boat surrounded by candles lies a cross, with the image of Jesus nailed to it, symbolizing her willingness to sacrifice her life for love. The tapestry she is sitting on is one she wove on her loom, depicting scenes of Camelot. The two images on the tapestry that can be seen are the Lady of Shalott herself riding toward Camelot in the boat, and sir Lancelot on a horse surrounded by other knights. Waterhouse depicted other images from the legend one in 1894, also entitled The Lady of Shalott, and another one in 1915 entitled “I’m half sick of shadows", whose title was quoted from Tennyson’s poem “The Lady of Shalott”. The Lady of Shalott by john william waterhouse is collected by Tate Gallery, London, England. Beautiful, original hand-painted artwork in your home. Interpreted paintings based on the masters' works of John William Waterhouse.This The Lady of Shalott needs about 14 - 16days for production by a talented artist. If you're not happy with John William Waterhouse The Lady of Shalott that you made on PaintingHere.com, for any reason, you can return it to us within 50 days of the order date. As soon as it arrives, we'll issue a full refund for the entire purchase price. Please note - PaintingHere.com does not reimburse the outgoing or return shipping charges unless the return is due to a defect in quality. If you want to purchase museum quality The Lady of Shalott at discount price, why not give us a try? You will save a lot more! This John William Waterhouse The Lady of Shalott needs 14 -18 days for production time frame. We ship all over the world. We can provide The Lady of Shalott Painting stretched canvas and large framed art.